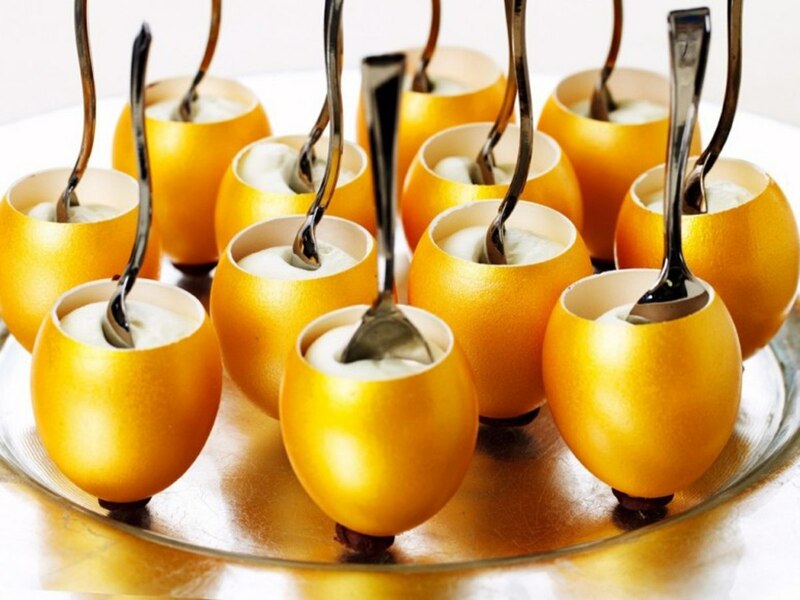 Easter is the start of a brand new life and the eggs should show that. For a bright colourful Easter, a great idea is to boil normal eggs and then get the kids to paint them in whatever colours they would like to use. It should be loud, bright and their own personality should shine through. 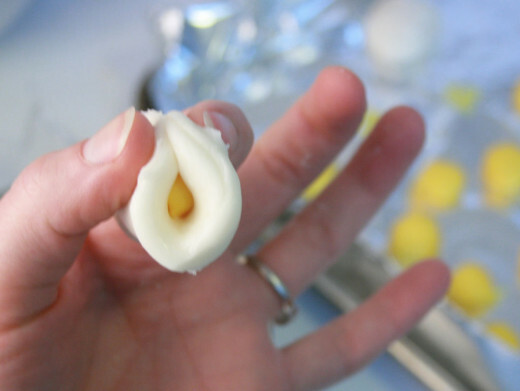 All you need for this fun activity is boiled eggs that have cooled down. The kids can also use coloured pens but that does tend to break the egg if they push too hard. 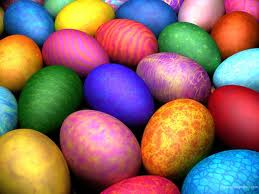 Paint is a much better choice to prevent the eggs from cracking. They can use their imagination and as many colours as they would like and once they have finished painting and left it to dry, they can use it to decorate the table for your big family lunch. It looks absolutely beautiful and the best part is that you can do this activity with the kids and the entire family can enjoy the artwork. Baking chocolate can taste terrible and for many kids it is the last chocolate that they will eat at Easter. There is not much that you can do to change the taste of the chocolate except for adding vanilla essence or a little cherry syrup. It does change the taste a little but if you can afford to buy normal chocolate then do so, as the entire point of making these eggs is for the kids to eat them and if the chocolate does not taste nice, then you have wasted time and money. All you need to do is melt the chocolate in a saucepan with a little milk, just enough to get the chocolate to liquify a bit. 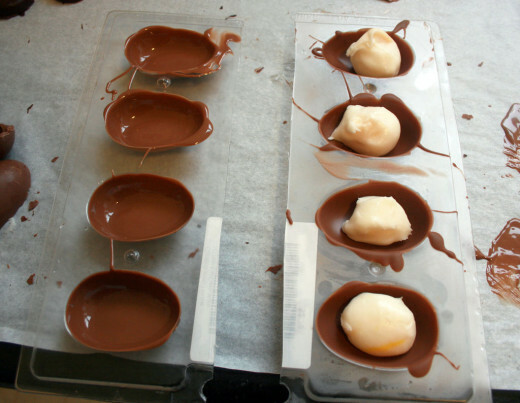 Once all the chocolate is melted, you can pour it into the moulds. 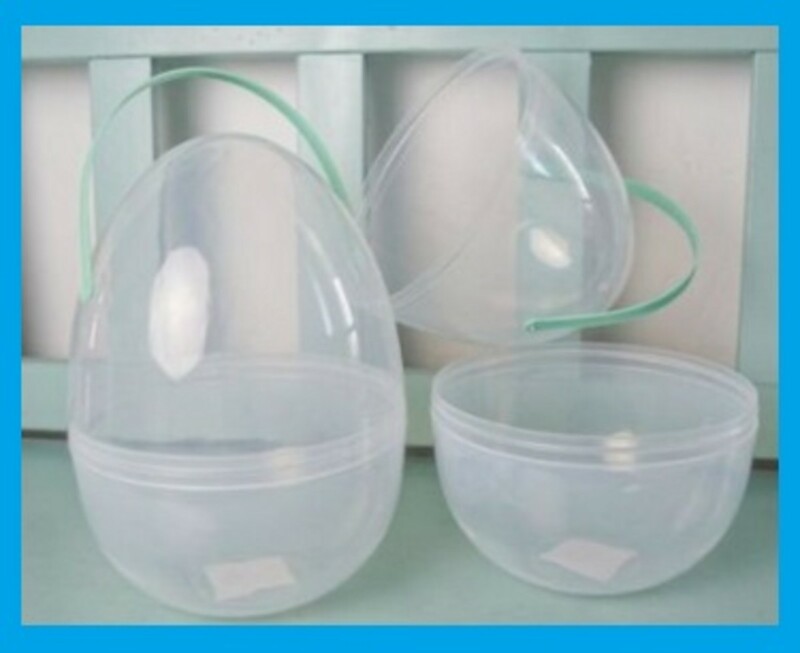 There are so many different types of moulds that you can use and you can even buy one here on the blog. Should you want the chocolate lollipops than add ice cream sticks to the melted chocolate before you let it cool down. There you go, chocolate easter eggs that you have all made yourself! 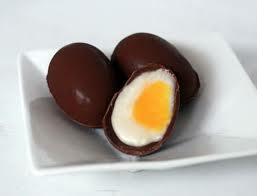 Another fantastic recipe is the Creme eggs and I found a really easy recipe for that. These are getting very expensive to buy in the stores and it doesn't cost as much to make them yourself. Everyone loves these and the homemade version is very impressive. 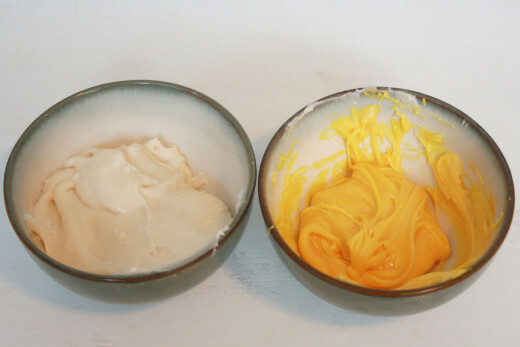 You can use your imagination for the creme but the one that I am going to use is the standard recipe. For this one remember that leaving chocolate in the freezer can cause it to crack, so allow it to cool down first and then put it into the freezer for a little while, removing it and placing it into the fridge. Holidays can be fantastic because you get to spend time with family and friends but it can also be hard work for those of us who have to prepare everything. 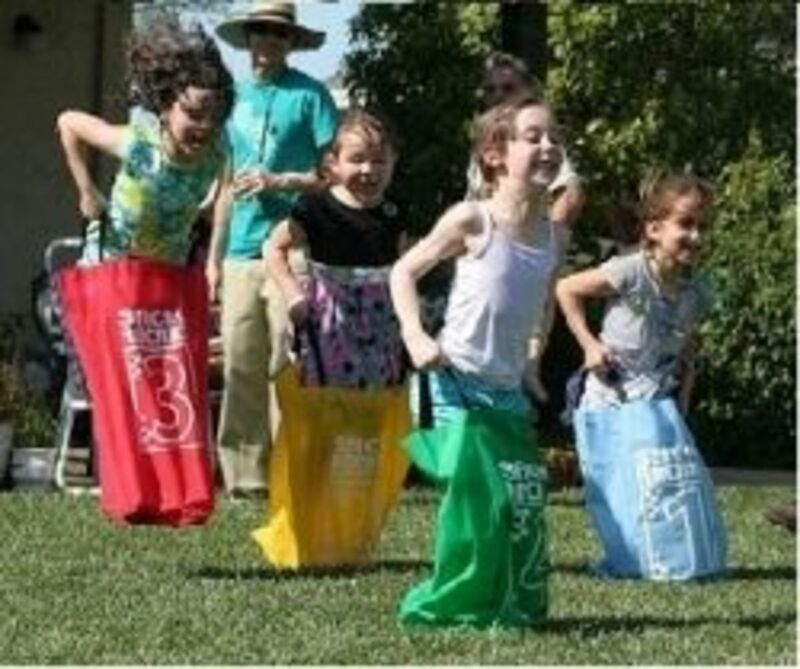 Finding easier ways to get the job done is easier said than done and family volunteer to help out but usually end up getting in the way. 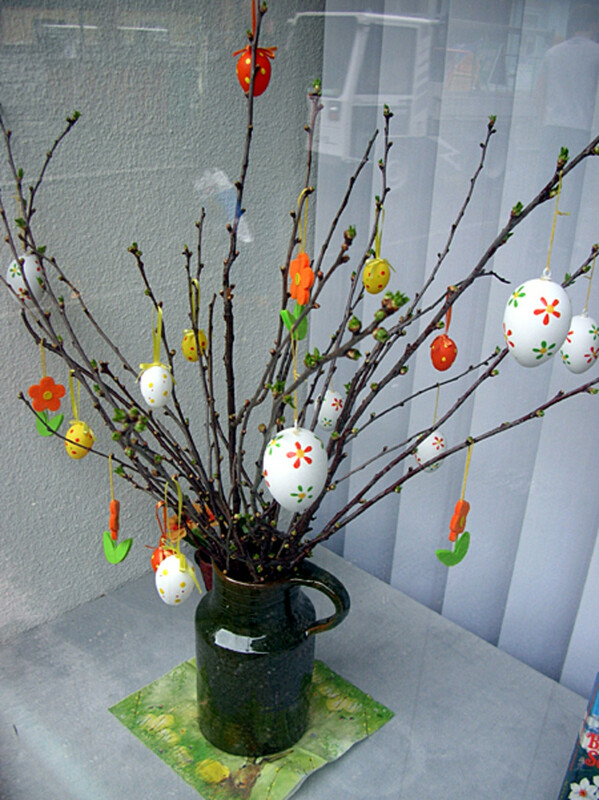 Making Easter fun and easy can be done because you can boil the eggs and get the kids to decorate them. Melting the chocolate is also a hard part and the rest can be done by the kids. Decorating should be done if you have the time and you enjoy doing it otherwise just get everything that you need together and delegate someone to do it for you. My favourite part of the holidays is spending time with my family as well as the cooking and decorating, naturally because this is what I love to do and do it for a living. I love decorating and doing unusual things to make the table look different and unique. The cooking part is sometimes a little too warm but for making chocolate and other things I get the kids involved as well, for them to have a little fun and for me to get on with other things too. 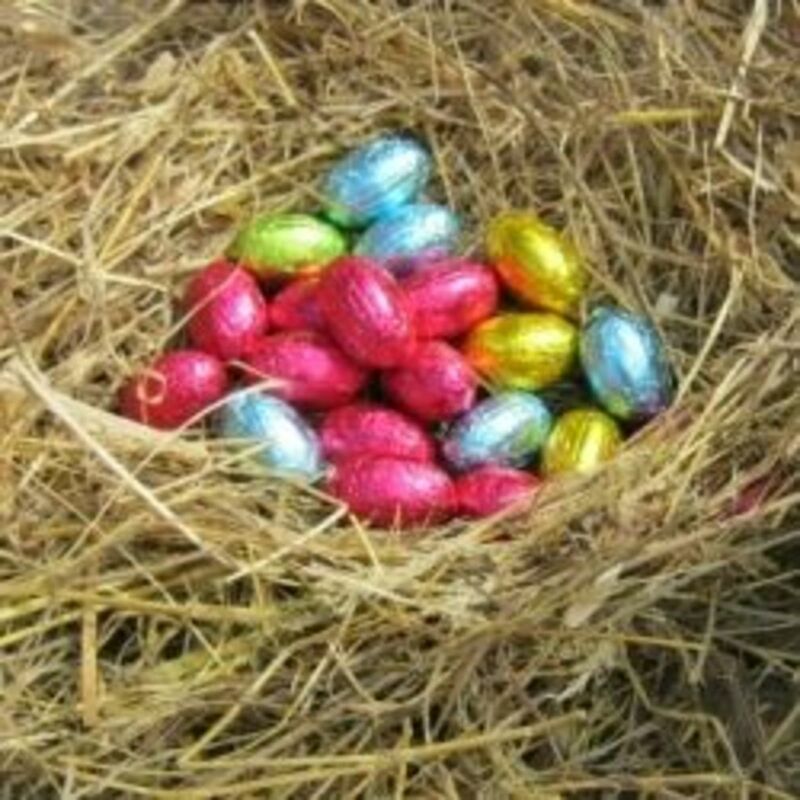 Easter to me is the beginning of a new life and that is why the eggs are given out at Easter. Life is full of colour and it should reflect that on your table when you decorate for Easter dinner or lunch. Bright colours like yellow and lime green are fantastic and because it is more for the kids than the adults, you can take advantage of that when it comes to decor by going colour crazy. As we traditionally use red and green for Christmas, I avoid those colours at Easter and bring out the crazy bright colours to lighten up the room and represent life. 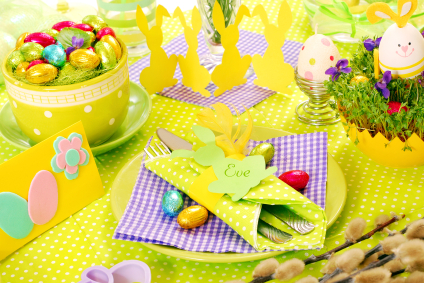 A great idea is to use a lime green table cloth and accessorise with bright yellow. 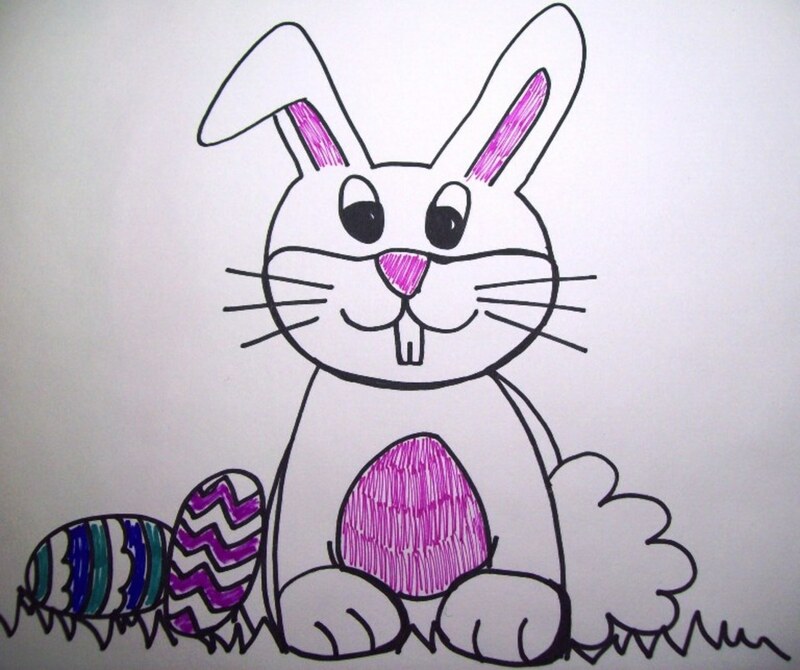 You can add pastel colours to the mix and almost anything will go with the coloured eggs your kids will make. That could be the main focus on your table and you can work around that as a feature by adding extra's to compliment them. 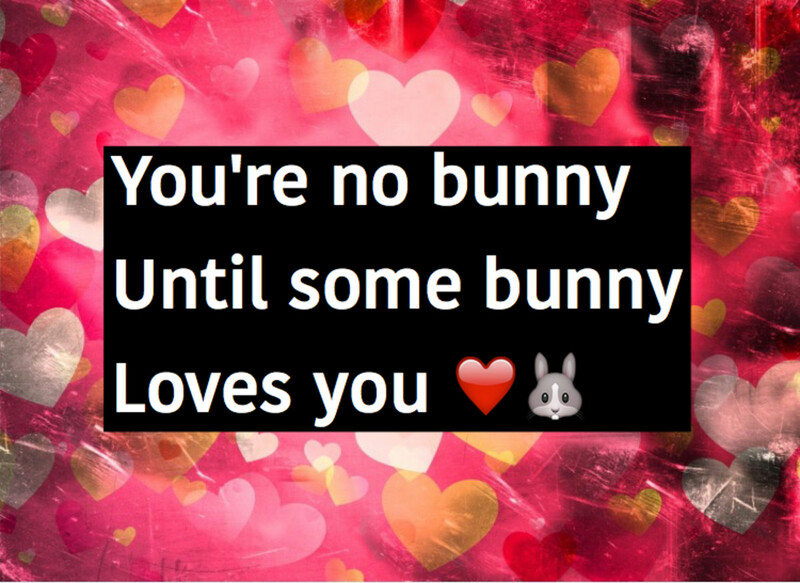 Anything to do with life is great for Easter and the brighter it is the better. Having floral arrangements is a good idea and the ones to use can be up to you as long as you select a multitude of colour. The room should look cheerful and bright with happy colours to remind everyone there that life is bright and colourful! 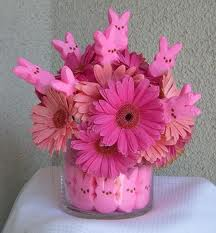 You could make your own arrangement and add little homemade Easter bunnies into it, that looks cute and the kids can help you make them. All you need for that is floral wire that you can get from a florist or a home department store and the kids can make the bunnies out of cardboard. Tape them onto the wire and stick it into the sponge that you have used for your flowers. It makes easter so colourful and its fun to watch the kids concentrate as they carefully paint the delicate eggs.